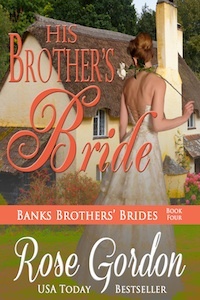 His Brother’s Bride ~ On Sale Now! While traveling around America, Elijah Banks makes a promise he’s unable to keep. So to guard his family’s name and his sister-in-law’s feelings, Henry Banks tells this beautiful stranger that he is the brother she seeks and impulsively agrees to marry the stunning beauty who introduces herself as Elijah’s intended. It might have been a while since she’d last seen the twins in New York, but she knows it’s Henry who is claiming to be Elijah—she just doesn’t care. One Banks brother is as good as the next, as far as she’s concerned. Her near ensnarement of and marriage proposal from Elijah was just part of her plan to seek revenge on their family, but Henry will suffice just as well. Now, without giving away either his identity or his heart, Henry must find a way to dissuade his wife from revenge—but he’s soon finding that ideas are easier formed than executed and with each attempt to change her mind, he loses a little more of his heart to this enchanting creature. Not the dimwit everyone has treated her as her entire life, she knows exactly what her husband is about. But while her mind refuses to accept his advances, her heart can’t deny them. Everything from his carefree manner to his genuine gestures is a stark contrast to the man she’d been married to before. Downloaded the sample. Going to comment again after I finished. Expecing a twist like “Gateway”. Completed few hours ago. You always rock. Do I need to say more? Everything about Rose Gordon is simply awesome! Oh no! I hope you were able to read it this weekend.